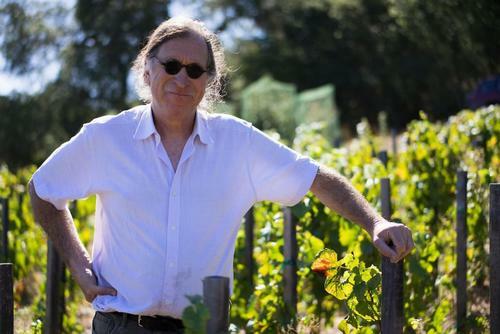 Randall Grahm is not your typical winemaker. While the wines he produces at his Bonny Doon Vineyard are exceptional, having garnered several rave industry reviews over the years, the road he took to success had a lot of atypical twists and turns. Growing up in Los Angeles and then attending UC Santa Cruz from 1970-74, where he was part of Porter College and studied philosophy and pre-med, Randall wasn’t sure what path to take after graduating. Randall refers to his time at UC Santa Cruz as a “golden age” where the students felt that anything was possible. “I had such extraordinary professors who I got to know and got to spend one-on-one time with,” he says. The idea to have students involved in designing labels was originally conceived by UC Santa Cruz’s Dean of the Arts, David Yager. “He was the primary agitator,” laughs Randall. “Randall is one of the most creative and caring people I’ve had the pleasure of working with, he is a true friend of UC Santa Cruz and the Arts,” says Yager. This year’s Banana Slug Red is exclusively available at the Bonny Doon tasting room in Davenport as well as on the Bonny Doon Vineyards’ website. Ten percent of each sale goes to the Arts Dean’s Fund for Excellence, providing financial support for students. When he was first starting out, Randall knew that he wanted to stay in Santa Cruz but wasn’t sure what kind of job he could do there to make that happen. So he found himself back in Southern California, working in a wine shop where he learned a lot, and got to taste a lot of outstanding French wines. After only a year, he realized that he really enjoyed the business, which lead him to take a winemaking course at UC Davis. He also discovered that his previous pre-med studies turned out to be perfect preparation for the chemistry and biology knowledge necessary for being a vintner. That talent combined with his creative, eclectic personality enabled him to draw on variety of his skills, bringing his esthetic, practical, scientific and artistic sensibilities all together. He also liked being able to do many things at once. Before Randall hit the scene, humor and winemaking had never dared to mix. But he came up with the enterprising idea of making his wine labels more interesting and fun by using wit and irreverent humor. He also was the first to popularize screw tops for wine and to implement true transparency in wine ingredient labeling. But, in spite of certain perceptions, his wines were and have continued to be a big hit with consumers. And over the years, he’s received many accolades, including Wine and Spirits Professional of the Year by the James Beard Foundation in 1994 and in 2010 the Culinary Institute of America inducted him into the Vintner’s Hall of Fame. Randall’s own anti-establishment persona and lighthearted spirit also contribute to making his brands so popular. Since 1984, when Bonny Doon released its inaugural vintage, Le Cigare Volant, which is still the winery’s flagship brand, the winery also had great success with its Big House, Cardinal Zin and Pacific Rim varieties, making it the 28th largest winery in the United States. To purchase a bottle of limited edition Banana Slug Red, please click here.